The Memory Cable is a good-quality five-metre instrument cable and you can use it, like any other cable, to connect a guitar or bass to an amp or interface. Plus it has a built-in recording module. It’s supplied with a 4GB Micro SD card, which can store up to 15 hours of CD-quality (44.1KhZ/16-bit) audio; you can use bigger cards if you wish. So, theoretically, you’ll never miss a particularly sparkling moment of improvisation, killer riff or songwriting idea again. The single AA battery that’s required should last for around eight hours. The February issue of Guitar & Bass magazine is available in print and digital forms from Friday 8 January. 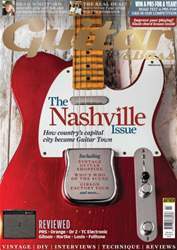 Join us as we take a trip to Guitar Town, tracing the history of the Nashville music scene and profiling a who’s who of the city’s galaxy of guitar stars. We go guitar shopping in Tennessee's neon-lit state capital and talk to two of the world’s leading fretted instrument experts, George Gruhn and Walter Carter, about the state of the vintage market today and we also stop by at the Gibson Custom Shop to see the company’s True Historic Les Pauls roll off the production line and find out what makes them the company’s best guitars since its golden era. Elsewhere in the mag, our DIY Workshop shows you how to ID a genuine 1950s Stratocaster, we talk guitar with Aerosmith legend Brad Whitford and we review a stack of great new gear from PRS, Dr Z, Orange, TC Electronic, Louis Electric, Fulltone, Hartke, Smorg Pedalboards, Pigtronix and more. If that’s not enough for you, how about the chance to win one of three PRS guitars for a year and become a roving reporter for G&B in the process? Buy the February issue of Guitar & Bass magazine in print and digital forms from Friday 8 January.